Dr Tedros provided a brief update on the Ebola outbreak in the Democratic Republic of the Congo, emphasizing that health security and universal health coverage (UHC) are 2 closely linked ambitions. He went on to outline a number of major initiatives and activities that WHO has undertaken or continued to prioritize in the past year. He then described the GPW13, which establishes the mission and strategic plan for WHO. President Paul Kagame of Rwanda also spoke at the opening plenary, focusing his speech on UHC – one of the 3 strategic imperatives outlined in the GPW13. He presented several reasons why UHC is transformational and deserves strong political commitment from leaders around the world, and shared specific examples from his own country where efforts to move towards UHC have produced encouraging results. During the opening plenary, Dr Yelzhan Birtanov, Minister of Health of Kazakhstan, was elected as one of the 5 vice-presidents of the World Health Assembly. Speaking on behalf of the European Union, a delegate of Bulgaria welcomed the proposed GPW13 and its strong alignment with the Sustainable Development Goals (SDGs), while requesting more details for certain areas of work to ensure that WHO can deliver on this ambitious plan. The delegate also stressed the importance of WHO’s global normative role and its work at the country level, emphasizing that reform at the global level should be accompanied by a needs-based assessment of each country office. A delegate of France reiterated the country’s commitment to supporting WHO and particularly to the goal of UHC. The delegate also underscored the importance of ensuring that health care is adequately funded by countries, that access to health care is equitable and that primary health care is strengthened within health systems. In a plenary intervention, a delegate of Germany noted that the country was very supportive of the Director-General’s recent visit to the Democratic Republic of the Congo to review the Ebola response. The delegate announced that Germany will provide an additional 5 million euros to help fund the effort, and called on Member States to follow suit. The delegate emphasized Germany’s commitment to working with partner countries to achieve health for all, noting that global health does not stop at the border. Political will and commitment from non-state actors are necessary to move towards UHC, a delegate of the Netherlands said in the opening plenary. The delegate also highlighted the Dutch Government’s commitment to actively promoting a healthy lifestyle among its citizens, to strengthening primary health care and to tackling the problem of high medicine prices. The delegate underscored the need for countries to invest in implementing the International Health Regulations (IHR) (2005) in order to support the WHO Health Emergencies Programme, and stated that the constituent countries of the Kingdom of the Netherlands will engage in an external assessment on IHR implementation in the coming months. The delegate referred to the upcoming International AIDS Conference in Amsterdam in July and welcomed delegations from all countries to attend. A delegate from the Russian Federation made the point that UHC should be a priority for all countries, as without it the world cannot achieve the SDGs. The delegate outlined some of the key areas where the country is working to improve health and well-being, such as expanding access to medicines and tackling the challenges of tuberculosis (TB) and noncommunicable diseases (NCDs). The delegate also mentioned the Russian Federation’s support for other countries in the Region, particularly through the WHO European Office for the Prevention and Control of NCD in Moscow. A delegate of the former Yugoslav Republic of Macedonia highlighted some of the country’s key activities related to health reform, which aim to improve access for all citizens to better-quality health services. The delegate emphasized the need for multisectoral collaboration and political will to make UHC a reality. A delegate of the United Kingdom acknowledged that much progress has been made to end poverty and improve health, but highlighted some of the key remaining challenges – including the need for better care for mental health and the growing threat of antimicrobial resistance. The delegate emphasized that there are great opportunities to work together to meet these challenges, including with partners such as nongovernmental organizations. Dr Zsuzsanna Jakab, WHO Regional Director for Europe, participated in a number of bilateral meetings with European Member States, beginning the weekend prior to the start of the World Health Assembly. Belarus: Dr Jakab encouraged the Minister of Health to further the country’s work on alcohol policy and agreed to visit Belarus to help boost the political attention given to this area. WHO/Europe colleagues in attendance also thanked the Minister for the strong collaboration with WHO on communicable diseases, and noted that Belarus makes use of 75% of the indicators for implementation of the Health 2020 policy framework. The Minister invited Dr Jakab to attend a meeting on TB taking place in the country in November 2018. Czechia: A new biennial collaboration agreement (BCA) was signed between Czechia and WHO/Europe. The Minister of Health expressed appreciation for collaboration with WHO in important areas of work such as tobacco control and financial protection. Other key priorities for the country include strengthening primary health care and digitalizing the health system. Dr Jakab thanked the Minister for the country’s role as host of the Sixth Ministerial Conference on Environment and Health in 2017; they both affirmed the need to fully implement the Ostrava Declaration, which resulted from that event. Germany: The Minister of Health expressed interest in intensifying cooperation with WHO, while Dr Jakab reiterated that Germany has a strong partnership with WHO at both global and regional levels. Dr Jakab pointed to the request from Germany, Ghana and Norway for WHO to coordinate the development of a global roadmap on the health-related SDGs as an example of the country’s leadership on health. The Minister asked for an update on progress regarding HIV and TB in the Region, which Dr Jakab and other colleagues provided. Additional topics covered included major upcoming health conferences in the Region and WHO/Europe’s work on migration and health. Greece: Dr Jakab discussed her upcoming visit to the country in June with the Minister of Health. This visit will mark the official opening of the WHO Country Office in Greece. The Office will aim to serve as a subregional technical hub, with a focus on primary health care and the integration of public health services at the level of primary care, along with migration and health. Kyrgyzstan: The Deputy Minister of Health and Dr Jakab discussed the need to strengthen work on the national health system and the SDGs, including a clear action plan for implementation. They discussed having a team from WHO visit the country to support the implementation of actions to tackle the social determinants of health. Other topics of discussion included road safety and electronic health (eHealth), particularly regarding norms and standards, and electronic medical records. Lithuania: The Minister of Health of Lithuania thanked Dr Jakab for WHO’s support on hepatitis B vaccination, particularly regarding price negotiations. Dr Jakab and the Minister also discussed the WHO mission to the country on tobacco control; Dr Jakab encouraged the Minister to continue efforts to fully implement the WHO Framework Convention on Tobacco Control and thanked him for his leadership on alcohol policy. Dr Jakab also offered WHO’s full support for ongoing health-care reform. A new BCA was signed between Lithuania and WHO/Europe. Malta: Dr Jakab’s meeting with the Deputy Prime Minister covered emergency response, including WHO’s response to the Ebola outbreak in the Democratic Republic of the Congo, as well as technical collaboration with WHO to address challenges in small-state health systems, NCD prevention and control, and road safety. A new BCA between Malta and WHO/Europe was signed. Slovenia: Dr Jakab thanked the Minister of Health for recently hosting the mission of European members of the WHO Executive Board and members of the Standing Committee of the Regional Committee to inform how WHO works at the country level. The Minister and Dr Jakab also discussed the upcoming Tallinn Charter celebration, the future role of the European Commission for health, the vital role of health within the 2030 Agenda for Sustainable Development and the need to take a multisectoral approach to health. Ukraine: Dr Jakab congratulated the acting Minister of Health on her leadership regarding the ongoing health reforms in Ukraine. The acting Minister shared that now 4.8 million Ukrainians have access to general practitioners registered at public health centres, and that the reform process is moving forward with strong political support. The Ministry of Health’s focus going forward will be on policy creation and ensuring implementation. A side event on UHC in fragile states and conflicts took place on 21 May 2018, organized by Afghanistan and Switzerland. The event aimed to raise the profile of the UHC agenda in emergencies. The organizers suggested creating a process to develop a concrete call for action to increase understanding and better support UHC in these challenging settings. 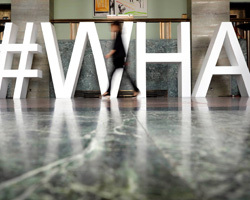 On 20 May 2018, on the eve of the Seventy-first World Health Assembly, WHO staged a major health promotion event in Geneva. The free walk/run event, titled “Walk the Talk: The Health for All Challenge”, was open to people of all ages and abilities. The routes of the event built a bridge between “international” and “local” Geneva and Lac Leman by linking key health, international and touristic landmarks found in the city. WHO/Europe staff joined with participants in Geneva and others around the world who took part in the event to show their support for healthy lifestyles.